One minute he was happily playing games with his sister in their parents’ home. The next, the 18-month-old boy had plunged 80ft from the seventh-floor apartment. But astonishingly, the toddler landed with barely a scratch – after bouncing off a cafe awning and into the arms of a passing doctor. 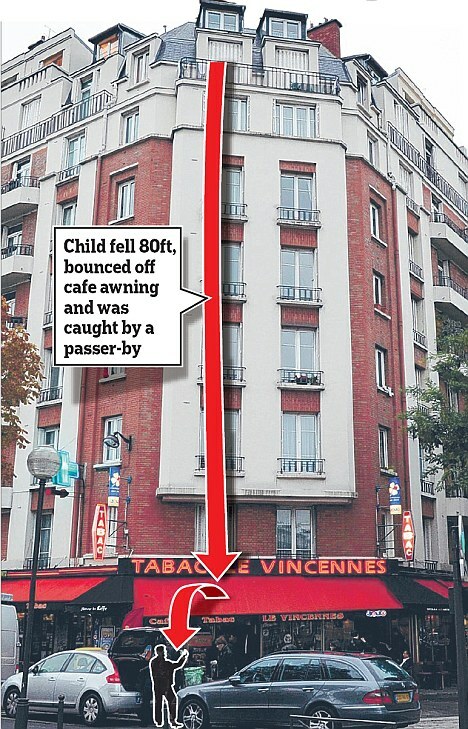 Before his extraordinary fall, the boy had apparently climbed through a window and on to a balcony after his mother and father ‘popped out’ of their Paris flat. Philippe Bensignor, the doctor who caught the toddler, was walking by with his wife and son on Monday when they spotted the child falling. He said: ‘I was there at the right time. My son happened to look up and he saw that a little boy was on the balcony and had somehow got through the railing and was playing on the very edge of a vertical drop into the street. ‘I just had the time to get across the street and place myself. I said to myself “whatever happens, I mustn’t miss him”. The cafe was closed for France’s All Saints bank holiday and the awning would usually have been down.